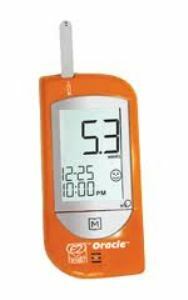 EZ Health® Oracle® talking glucose meter has a revolutionary speaking function which lets people hear as well as see their glucose results. At the recent Canadian Diabetes Association meeting in Montreal doctors, nurses, diabetic educators and people with diabetes were excited about this new and innovative meter. The Oracle® meter is also helpful for newly diagnosed diabetics, the elderly, and those with vision problems. The Oracle® meter has all the best features available: no coding, small sample size, fast results, a large screen, alternate site testing, and computer downloadability. Oracle® turns on automatically when test strips are inserted and turns off when the strip is removed. It has a single button on the front to access the memory. It even has a reminder to check for ketones if glucose levels are above 13.3. The Oracle®'s finest feature is its talking function. The voice level is adjustable and can be turned off for people like Theresa, who love the simplicity of the Oracle® meter but don’t always want their meter to speak.